Ninjas didn’t Actually wear black. 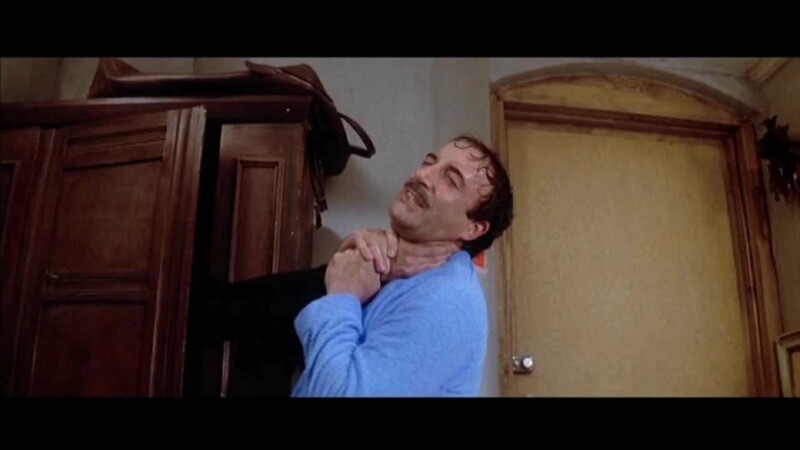 Think about it, if you’re going to sneak up on someone and kill them you’ll stand out like a bad guy on CHiPs if you’re dressed completely head to toe in black. and you unlike everyone else is wearing a mask. Brought to you by BroScience. The game is very new, I’m not sure you can get it yet except via kickstarter but it’s worth looking for. The first player takes a number of black House die and rolls them, in the first round this is four dice but in the next three it will be five then six as the houses become harder to break into. 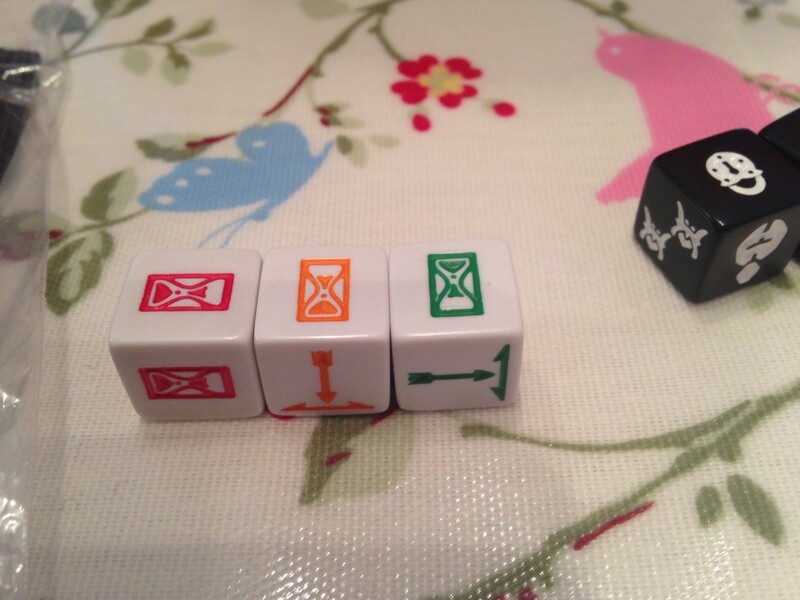 These house dice have symbols for locks, guards and citizens or multiples of these. The crafty ninja now rolls their white action dice and try to match up with symbols on the house, So if they roll keys it opens a lock, sneak icon they can match them with guards and citizens, Throwing Stars against guards and the wildcard ninja symbol that’s anything you like. 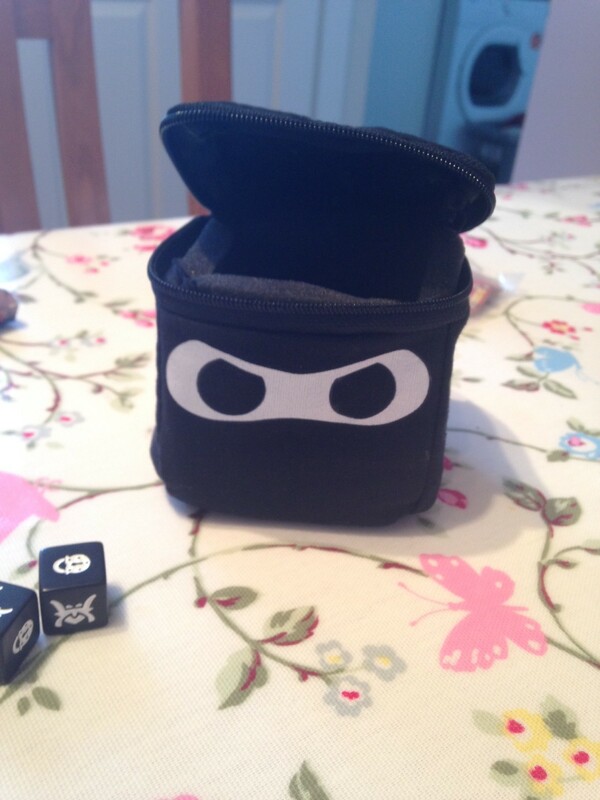 Ninjas get to hold and reroll whichever dice they like but there’s a time limit which I’ll explain badly later. So far so Yahtzee but there’s a couple of dice I didn’t mention (drip feeding the rules you see). The ninja can also roll a (can’t remember the real name so I’ll make something up) Abundance dice that you put with a sneak/star/lock/wild dice to give you four of them. In addition to all this the aforementioned palsied ninjas are flinging arrows at you. 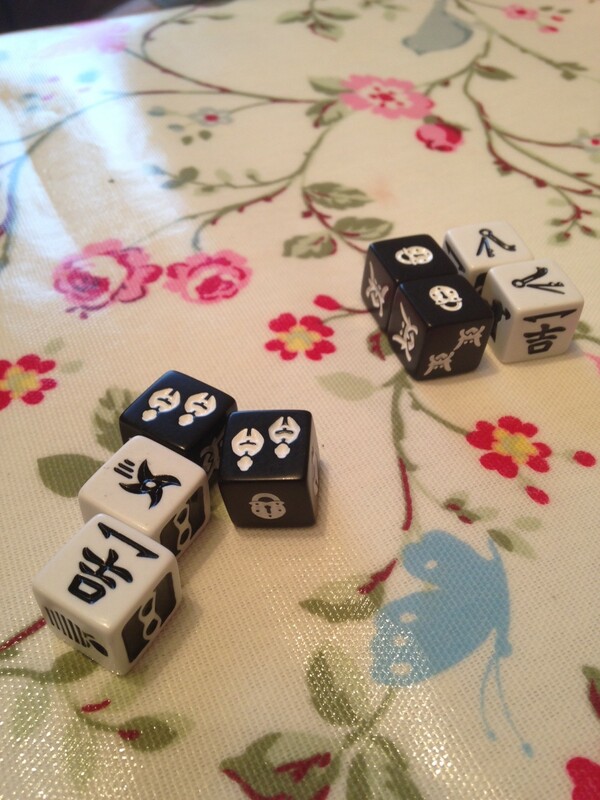 the DIRECTION the dice lands in (in a similar fashion to an artillery dice in warhammer) determines whom gets hit. The weasel like ninja breaking in has a final symbol he can roll a catch arrow one that stops him from being skewered by an arrow. Since the arrows are flying nilly willy it’s quite possible to hit another spectator ninja. Hitting someone will reduce their score by one and it’s the DICE of the other players you’re aiming at, not as we first though the players themselves who squirmed and moved through the first half of the game to avoid incoming fire. If a spectator ninja rolls an hourglass symbol they lose their dice and if all the spectators roll them it’s time up for the thieving ninja. If the main ninja succeeds in breaking into the house they get a score for what they overcame and a bonus if they did it stealthily rather than with ninja stars. They can at any stage of course wimp out and leave the house but they lose out on score. So it’s a push your luck game. This is a great little game. I’m going to try and pick up a copy. It’s quick, it’s simple and the whole position on the dice is a nice mechanic. Dice are all in now, Marvel Dice Master, Luchador! Mexican Wrestling (more on that in another post). Quarriors! eh… not so much. But anyway, this is a nice little filler dice game and it comes in a rather natty holder. It’s gets a solid two thumbs up from me. You’ll need an IV if you’re coming to Knavecon 4….